In the midst of New Year’s Resolutions, fad diets and new gym memberships, we ventured to Piccadilly Circus to visit the BODY WORLDS exhibition - a ‘museum experience’ that is the brainchild of Dr Gunther von Hagens and consists of real human bodies displayed in such a way that they reveal the truth of what goes on beneath our skin. This exhibition has come at a time when there seems to be an ever-growing awareness of the importance of looking after our bodies, and not just for a few weeks at the start of the year, but in a more sustainable and prolonged way. Whilst exercise and fitness are arguably more popular than ever, it is mental well-being that is driving the current interest in ‘good health’ and appreciating how incredible our bodies are. BODY WORLDS gives a unique opportunity to witness this for yourself. BODY WORLDS opened its doors in London in October 2018, and has become one of the biggest new UK attractions to open in the past decade. It becomes the fifth permanent BODY WORLDS exhibition in the world, alongside 7 travelling exhibitions that have attracted more than 47 million visitors in over 130 cities across America, Africa, Asia, and Europe. What all of these exhibitions have in common, and what makes them unique, is the use of the most up-to-date plastination technology created by the inventor of the process and anatomist Dr. Gunther von Hagens. “The purpose of Plastination from its very inception was a scientific one, to educate medical students. But the interest that laypeople had in the plastinated specimens inspired me to think of creating public exhibitions, which was followed by the realisation that I had to offer a heightened sense of aesthetics, to avoid shocking the public and to capture their imagination. This museum in the very heart of London is the culmination of my work and my contribution to open the heart to our inner self and makes us fall in love with our own body”. BODY WORLDS provides a fascinating insight inside the human body through the fusion of science, art and health education. 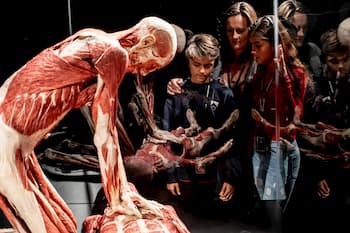 The exhibition uses over 200 real ‘plastinated’ bodies and body parts to take visitors on a journey through aspects such as the ageing process, diet and cholesterol, the beating heart and cardiovascular systems, and pregnancy and reproduction, in more detail than has ever been previously possible. For me the experience was quite a rollercoaster. From the moment I stood in front of the first exhibit, feeling a mixture of shock and wonder as I told myself this had been a real living breathing human, now preserved in death for us all to gaze at, to the moment, just a few minutes later when I felt completely detached from this fact and now viewed the exhibits as ‘detailed models’ that could teach me what I didn’t know about the body. Then, with each example of physical disease, such as the cross- section of a brain that had experienced a stroke, or the cross-section of a breast with cancer, or watching the animation about Alzheimer ’s, I once again felt the poignancy of what I was seeing, by connecting it to real people that I know and love who have experienced such illnesses. And then perhaps the hardest thing of all to view from an emotional perspective, was the display of human foetuses at different stages of development. And yet, at the same time, I was filled with a sense of awe at the incredible miracle of life. This is an experience that will make you think, question your life choices, and feel the strongest of connections with your fellow humans. Whether 2019 is all about a dedication to exercise, a promise to give up smoking or alcohol, spend a bit less time glued to a screen, or just to take a step back and have a bit more ‘me’ time, BODY WORLDS London serves as a reminder that modern life has a massive impact on our bodies, and gives visitors an unparalleled glance at how just one small change can make a difference to our physical and mental wellbeing. Exhibits such as the smoker’s lung vs healthy lung, the fatty liver, ‘Laughter is the best medicine’ display along with other interactive displays such as the CPR training unit, blood pressure and heart rate monitors and light-up stress ball, all highlight the complexity and beauty of the human body, and just how best we can look after our own. BODY WORLDS London is open 365 days of the year, Sunday-Thursday 9.30am-7pm and Friday-Saturday 9.30am-9pm.